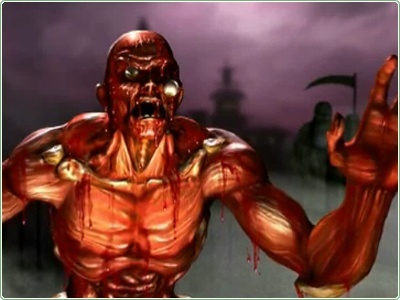 Meat was a horrific experiment created by Shang Tsung. He escaped the sorcerer's clutches before he could be fully completed. 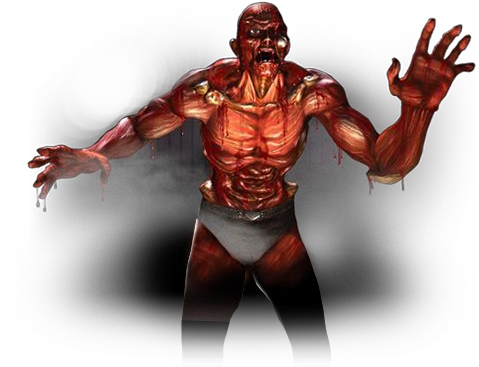 Meat was a secret hidden character who was playable in MK4 and MK Gold. He was brought back as a selectable character in MK: Armageddon. At best, Meat was an entertaining "joke character" in MK4/Gold. He seemed thrown in as a last-minute secret character... but was worth a few laughs at least. Why Midway decided to bring him back in Armageddon, wearing underwear, is another discussion. They clearly didn't put much thought into his re-design, making his inclusion in MK: Armageddon roster seem forced. Although, the fact that he exists in the game makes Armageddon's roster seem as comprehensive as humanly possible. Too bad the game sucked. Fuirthermore, Meat appearing in Armageddon right alongside other prominent MK games helped give the game the "cheap" and low-budget vibe that it seemed to be going for. "Grraaadededededaaaah!" Brilliant design, Midway. No wonder you went bankrupt.